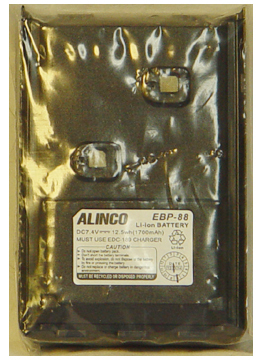 The Alinco DJ-500T 2 meter / 440 MHz dual band HT is ruggedly built to MIL-STD810G standards. 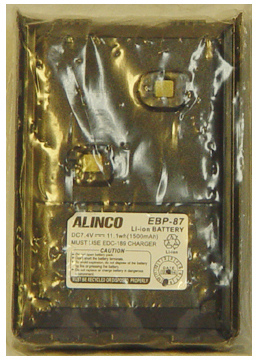 This radio transmits with a full 5 watts on both bands (or 5/4.5 on batteries). In fact you can select three RF levels (5, 2.5 or 1 watts). This radio has 200 memories, two-step attenuator, wide/narrow FM TX/RX, back-lit alphanumeric display and direct keypad frequency entry. 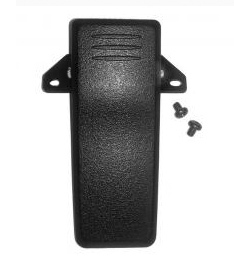 The receive range is 136-173.995 MHz, FM Broadcast 76-108 MHz, and 400-480 MHz. Tuning steps are: 2.5, 5, 6.25, 8.33, 10, 12.5, 20, 25, 30 and 50 kHz. A strong 1 W audio (10% dist.) amp provides big audio. Both frequency and memory scanning is supported. Direct frequency entry via backlit keypad. Each DJ-500T/TB includes: EDC-189 drop-in charging tray, EDC-191T AC adapter, EBP-87 7.4 V 1500 mAh Li-ion battery, removable SMA flexible antenna, EBC-34 belt clip and hand strap. 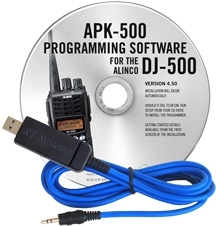 APK-500 Windows programing software CD with USB-29A computer cable. Copyright 2014-2018, Universal Radio, Inc.